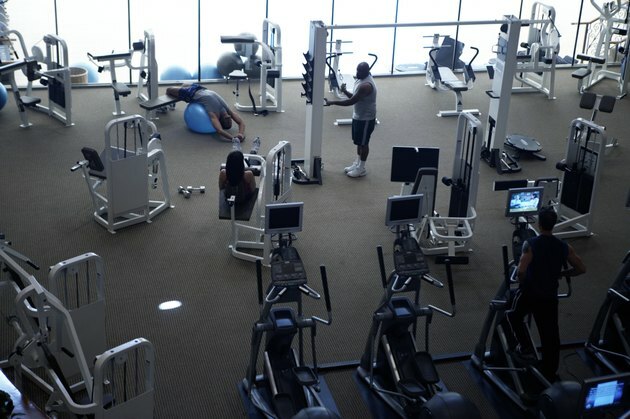 Seeing people using the weight machines in the gym can be daunting - they all seem to know exactly what they're doing. One of the things you need to decide on is how many reps you're going to do per machine, and this all depends on the amount resistance selected or loaded onto the machine and your goals. Not to worry, though, because learning the basics about reps and resistance can be easier than you think. When working with weights or weight machines, there are 3 basic training categories you can choose from - endurance, hypertrophy, or strength. While all three build strength, each category has different rep requirements (which produce different results), so it's up to you to choose which one best fits your goal. Endurance training builds up your ability perform a difficult task repetitively. For example, a boxer needs to be strong to throw a good jab, but he also needs to have endurance so he can put the same amount of strength into the rest of his jabs throughout the round. For endurance training, your goal should be to max out, which is the point to where you are close to or unable to complete another rep, at 12-20 reps, or even more. This means if you do perform the exercise properly and you are able to do more than 20 reps, you should consider increasing your resistance, depending on your training goals. If you can't even get to 12 reps, you should decrease the resistance. Hypertrophy is the medical term for enlargement, so when you work in this zone, the muscle cells get larger. This is a popular type of training for all of those people who want to get big and "bulk up". To train for hypertrophy, aim to max out between 8 and 12 reps. Again, this is the point to which you should feel like you are close to or can't perform another rep. You again may have to adjust the weight, increasing it if you can't get to 8 reps and decreasing it if you can get more than 12. To focus primarily on strength, you'll want to work in this category. Remember the boxer who needed endurance? Well strength training would be more comparable to a competitive weight lifter. He needs to lift a great deal of weight, but he doesn't have to do it over and over. For strength training, you want to max out around 4-6 reps. Although it is good to use good form and technique with all exercises, it is especially important to have good technique when working in this category to avoid injury using the highs amount of resistance. When beginning weight training, start with one set per exercise. You can work your way up later. You also want to develop good form and technique for safety purposes. For each rep, you want to go through the full range of motion that your body and the machine allow. Your movement should be slow and controlled (taking at least 2-3 seconds each direction) during the rep. Slow movement and going through full range will maximize your overall results. Finally, you want to avoid holding your breath. As you're doing the difficult part of the rep, exhale. Inhale as you bring the weights back to neutral. Free weight exercises can be more challenging, depending on the exercise in question, as the stabilization provided by the machine is absent and more of the body's stabilizer muscles are recruited into the exercise. Accordingly, you might need to train to somewhat higher rep ranges on machine exercises in order to attain the above ranges with free weight versions of the same exercise. And finally, have fun as you enjoy the many benefits of weight training!